In business the first impression always counts. If someone is dissatisfied with what they see, the chances are they’ll keep walking until they get to the competition. If they like what they see they’ll probably head through your front door to find out more about what you do. Regardless of what kind of commercial business you run in Oakville or Burlington, we’re sure you want to run it to the highest standards. This includes making sure you take good care of your premises – otherwise you’ll have more people walking past than coming in. You may be too involved with your business to notice what it looks like to other people. But the first opinion people will form about your business – whether you like it or not – is what it looks like on the outside. If you have dirty windows that your employees can barely see out of, you’ll be giving the wrong impression to everyone who is considering doing business with you. But give them a sparkling building with wonderfully clean and shiny glass to look at and there is a better chance that they’ll walk through your front door. Cleaner Windows works for both private householders and major companies and businesses in the commercial sector. Whether you’re in a small building with two floors or a huge office block, we can handle your window cleaning needs. We’ll also tackle the inside of your windows as well as the outside. Contact us now to find out more. If being environmentally friendly matters to your business, you’ll certainly be pleased with the way we do business. We use a pole fed watering system that means we can stay on the ground floor. This system also enables us to use pure water. This is water that has been filtered to ensure it doesn’t contain anything that might leave streaks on your windows. You can proudly tell all your clients that your window cleaning company cares for the environment – just as you do. But we offer more than that. We also offer the peace of mind that comes with knowing your office or commercial building windows are being cleaned regularly and with dedication. You’ll always get an impressive finished appearance with our approach to environmentally friendly, top quality window cleaning. Contact Cleaner Windows today to find out how we can help you and your business shine. You’ll recognize how important it is to make sure people get the right impression of your business from the word go. Your professional appearance can impress potential clients and customers before they even step through the front door. Cleaner Windows works for all manner of different commercial companies throughout the Burlington and Oakville areas. 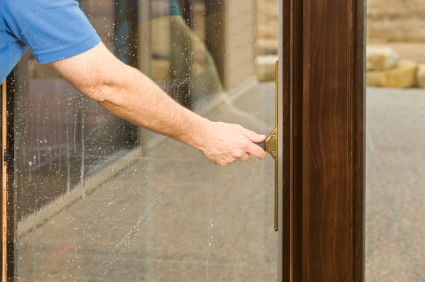 We have a dedicated and experienced window cleaning team that knows how important it is to make a good appearance. We use only the best equipment and we make sure that we tackle every job – whether small or large – with the same dedication and attention to detail. We know how important the exterior of your commercial building is. Caring for and protecting your windows is an essential part of the regular tasks that need doing. Once you’ve got Cleaner Windows on the job you can rest assured your windows will always look their absolute best. They’ll give you a better view from inside and a more impressive appearance outside. Talk to us today and find out how much better your building will look when Cleaner Windows has done its job! With regular cleaning your windows will never let you down.